Both of us (Bridget Currie and Chloe Langford) had independently used dough in varying forms in our artistic practices before our microresidency at FoAM. Chloe had mostly used salt doughs without yeast, and Bridget had explored commercial yeast and sourdough. Our interest in working together sprang from shared ideas about dough as a medium: dough resists neatness and control; an aesthetic of the unmade, lumpen and formless. It is an unwieldy mass that provides a physical confrontation with intractable matter. This stuff is not fluid, it is a sticking point for the mind to flow around, and as such acts as a provocative anchor to the mess of the world. 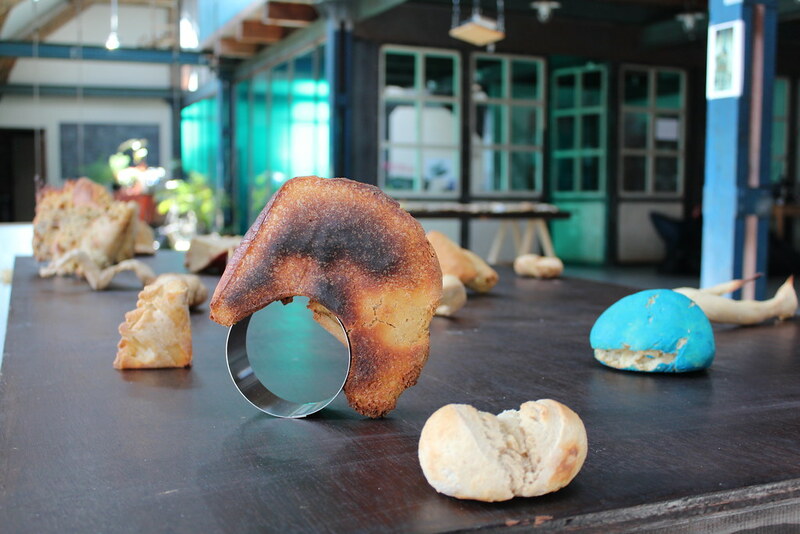 Our aim in the microresidency was to experiment with a variety of yeast-based doughs in order to examine more closely how the material best “expressed itself” (an admittedly subjective concept) in sculptural forms. Initially we had hoped to gain access to a large oven in the vicinity of the FoAM studio to make bigger bread forms. However, after Bridget asked around at a number of neighbourhood bakeries and pizzerias it became clear that this would not be possible, so we confined ourselves to FoAM’s own studio oven (33 x 60 x 45 cm in size). Evidently the oven is still a very precious space and bakers seemed worried about cleanliness, lost production time, and really our own status as amateurs: potentially unpredictable elements in their kitchens. As it always has been, the oven remains an expensive and valuable piece of equipment for cooks, bakers and chefs everywhere. The starters each had 100–200 g of mixture taken out and used to make bread, and were then fed daily with 100 g flour and 100 g water added to the mixture. Time is the most active force with wild yeasts, and how long a culture has existed and how long it is left after fresh “food” has been added are crucial factors for the final qualities of the dough. Overproofing collapses the dough into a deliquescent mass, as the yeasts die off from their own wastes (alcohol). Our favourite mixtures were the starter with spelt, as it gave a very open grainy texture to the bread dough – slightly looser and softer – and Bridget’s starter, since it had been going the longest. The old bread dough starter was vigorous and had a strong rising action. 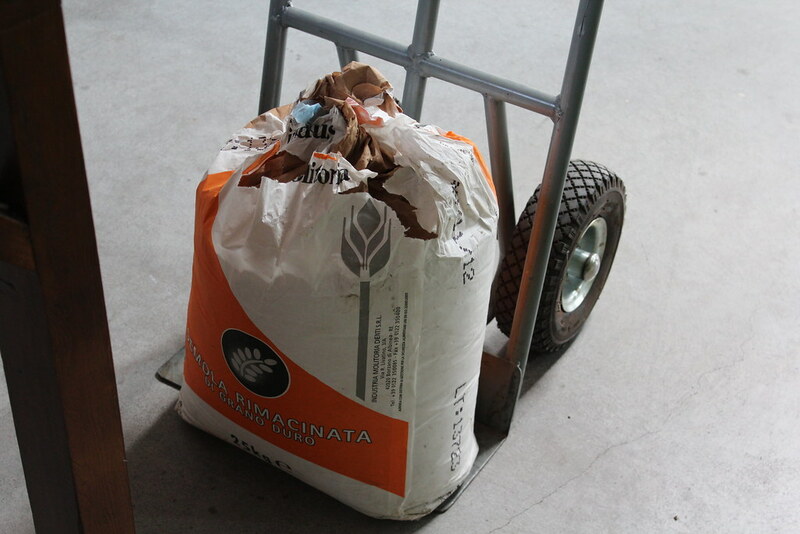 We acquired a very large sack of Italian durum wheat flour donated by local pizzeria La Belle Equipe, and this was used to feed the yeast starters and make the breads as the microresidency got underway. Along the way we noticed a variety of techniques and forces involved in the small experiments we had made. These included gravity, weight, elasticity, stretching, falling, rising, cutting, pulling, charring and sinking; the skin forming on the dough, the stringy interior. We placed the dough on different kinds of supports – silicon, cloth and metal – to experiment with how quickly they would sink on these surfaces, and what textures would be created on the surfaces of the dough. During the research gathering, we were asked what brought together our favourite pieces from the experiments we had presented. This was a helpful, focusing question. Many of our favourites had a sense of motion in their form – sinking in surrender to the forces of gravity, but also rising due to the living cultures within their matter. These pieces seemed to capture the “livingness” of the dough, the way it quietly bubbles up, its warm, resistant mass against your palms. Still “obstinate lumps,” but lumps that could balance lightly on their feet and spring forth. They remained modest in size, and were also still clearly recognisable as breads. This was appropriate, as it became increasingly important for us to develop an “empathy” with the material itself rather than using it as a vehicle for expressing “emotions”: letting the dough speak for itself and attempting to find the forms which best facilitated this. In our discussion sessions, Rasa raised an important question: why dough? For us, dough was the medium we wanted to explore for several reasons. Most people are familiar with it on a basic, tactile level, through touch. While an Expressionist painting, for example, might try to capture the kinds of movement inherent in the depiction of the body through paint, we were more interested in the interaction between the body and the materials and forces it is more likely to encounter in everyday life. And dough also seems to have a slightly amusing, cheeky quality to it – a homey, cheap material masquerading as art. In the last days of our residency we worked on a series of videos, allowing piles of dough to slowly sink around our ankles like the ocean, and battling to free our feet from doughy quicksands. Dough’s aliveness is also an attraction to us. Yeast is an organism with its own biological rhythms and life cycle. By using various grains and wild yeasts captured from the air we could give form to unseen microorganisms. Dough pushes back, it is alive and physically has its own logic. Its aliveness makes us more aware of its volatility – the sensitivity of its interactions with environmental conditions. Some questions were still left unresolved after our week of researching and experimenting. One is the potential edibility of our bread-sculptures. In a future iteration of the project, it might be interesting to try to create edible forms – although whether this would really add something to the project is unclear. Perhaps the implications of the sensation of tasting the forms would be more significant. Smell is also an interesting element – both the sour, almost sickly smells of the yeasts and the warming scent of the baking. Methods of presenting works like this is another unresolved question. We can imagine these sculptures somewhere outdoors, more vulnerable to the living forces of the world. We have traveled with the baked dough forms, leaving them in parks, on the beach, in the streets and forests of Brussels. When nothing is left, these sculptures will have rotted, been eaten or washed away. The microresidency has helped us initiate a collaborative process and clarify a number of connections in our artistic work. We share the same approach/process of “making strange” or “re-weirding,” where we take known materials (in this case bread) that are laden with symbolism, memories and tacit knowledge, and try to work with them in a way that reveals the material again, reveals it as a wonder.